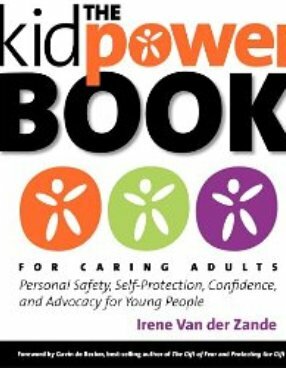 This book written by Irene van der Zande is an essential encyclopedia on how to keep children and teens safe. This is a must have for all parents, both for the practical and carefully researched information and for the clear drills that any caring adults can use to practice safety skills with their child. This is also an excellent resource for martial artists and self-defense instructors wanting to build or enhance their programs for child and teen safety skills. “The Kidpower Book” for Caring Adults: Personal Safety, Self-Protection, Confidence, and Advocacy for Young People. This is an easy-to-use complete guide putting Kidpower’s 23 plus years of experience at the fingertips of parents and all adults who care about protecting children and teens from bullying, abuse, abduction, and other violence; preparing them to empower young people with skills and knowledge for developing positive relationships, increasing their confidence, and taking charge of their emotional and physical safety. You can preview at Click to Look Inside on Amazon. If you order through Amazon, please write a review and rate the book. $29.95 USD. Contact safety@kidpower.org for discounts on orders of 10 or more. Another option is an abridged 100-page version of this book, How to Teach Self-Protection and Confidence Skills to Young People, which is now available for $14.00 USD. All income from books sales goes to help our nonprofit organization cover the cost of publication and of providing educational resources. The layout, photos, and illustrations are the icing on the cake that makes this book even easier to read. There are over 400 pages of inspiring stories, hands-on activities, and clear explanations are provided through the following chapters which are easy to read and bound to be helpful for you and your child. The following chapters will cover and give you the information you require.